Tree roots are not like carrots. Tree root systems can spread 2 – 3 times wider than the height of the tree. Most of the tree’s absorbing roots are in the top twelve inches of the soil. Water deeply and slowly. Apply water so it moistens the critical root zone to a depth of 12 inches. Methods for watering include a deep root fork or needle, soaker hose or soft spray wand. Apply water to many locations under the dripline. If a deep root fork or needle is used, insert the device no deeper than 8 inches into the soil. Consistent moisture is essential. It allows for better root water absorption. Drought stressed trees are more vulnerable to disease, insect infestations and branch dieback. Use this rule of thumb: small trees (1”-3” diameter) 10 gallons/inch, medium trees (4”-8” diameter) 10 gallons/ inch, large trees (10”+ diameter) 15 gallons/ inch. Use a ruler to measure your tree’s diameter. Determine your tree's dripline. The dripline is the area underneath a tree that encompasses the majority of a tree's roots. To determine the dripline, measure the circumference (in inches) of the tree at 4.5 feet height. Divide this number by 2 and then measure out that many feet from the trunk. For example, if a tree has a 40" circumference, the majority of the roots will be within 20 feet from the trunk in all directions. Water trees during all four seasons. In the Spring and Summer water small trees 4 times per month, medium trees 3 times per month and large trees 2 times per month. During fall and winter, October through March, water one to two times per month, depending on weather, temperature and soil conditions. You should winter water when it is above 40 degrees and when there is no snow cover. Mulch is critical to conserve soil moisture. 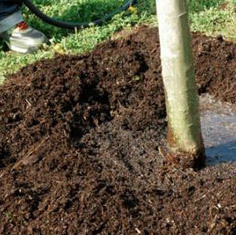 Apply mulch within the dripline, to a depth of 4 inches.